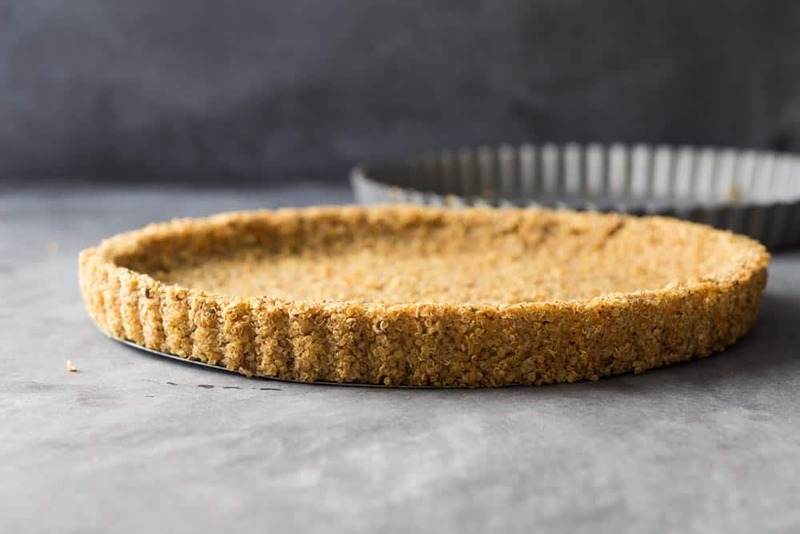 This 2-Ingredient Quinoa Crust is both a naturally gluten free pie crust and a naturally vegan pie crust. It serves amazing as quiche crust and if made flat even as quinoa pizza crust. I am SO proud of this recipe! SO SO SO proud! 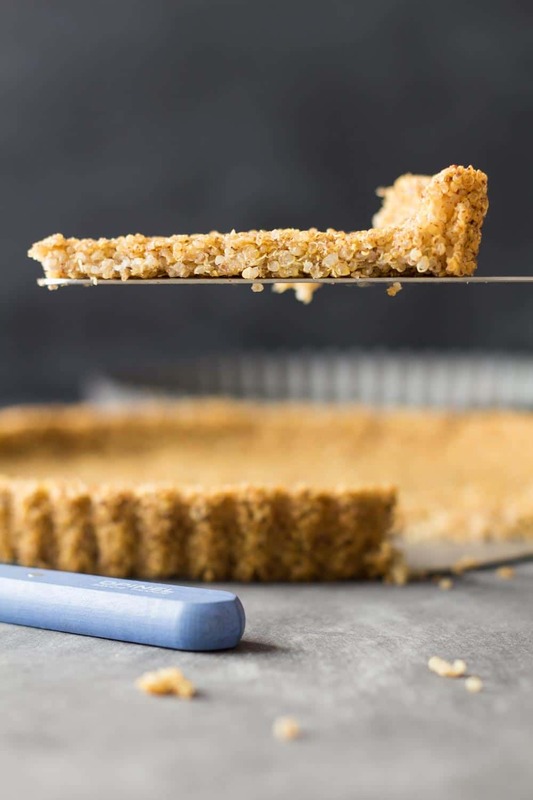 I mean 2-Ingredient Quinoa Crust, the title says it all. It screams amazingness!!! Ok, so, usually a gluten free pie crust has an ingredient list that makes you dizzy. 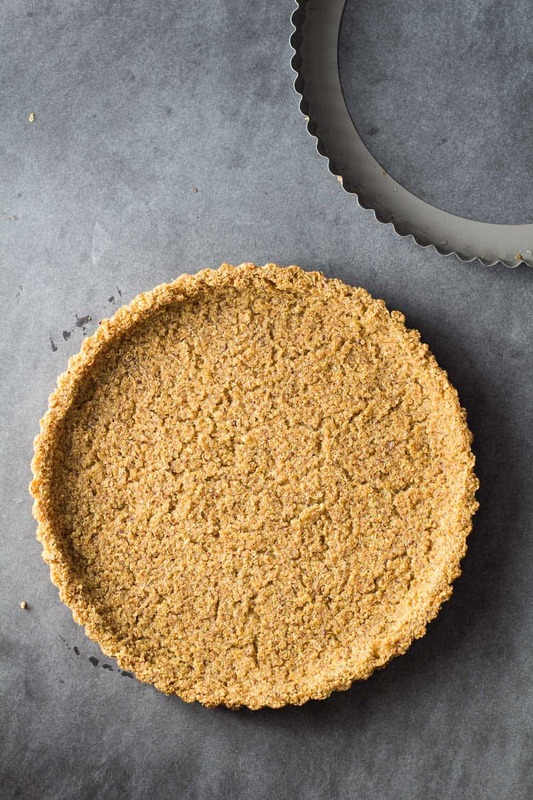 In order to get the crust to resemble a regular wheat flour butter crust one has to work with several different gluten-free flours and/or all kinds of sticky stuff that isn’t egg or butter. In case you haven’t noticed, all my gluten-free recipes are always recipes that do not try to imitate anything other than what they are. Gluten-free recipes should be naturally gluten-free in my opinion. Without trying to resemble anything other than what they are. That way they aren’t compared to anything else and just enjoyed without thinking something is missing. Was this too confusing? I mean, I don’t like all those gluten-free “tastes like flour” sponge cakes that don’t taste like the real thing AT ALL and are almost always made of 10 million different flours to get a semi similar consistency to wheat flour. Enough of the rants. Let’s get started! Yes, you can use this crust for savory quiches or sweet pies and even pizza crust. It’s super versatile. Quinoa has somewhat of a nutty flavor and tastes amazing both salty and sweet. I figured, if the crust didn’t stick together as planned, and fell totally apart after baking, I could simply eat as a side. Right? It did however hold its shape amazingly! Which is why I’m here today to share the recipe for the naturally gluten free crust itself. It deserves a whole blog post and recipe card. 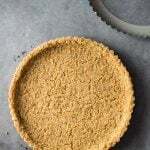 I still have to experiment with it and use as gluten-free pie crust as in “sweet pie”. You can read in comments though that others have already had success with it. Add a little honey or maple syrup to the crust to make it sweet. Quinoa is vegan, flax seed is vegan and water is vegan. 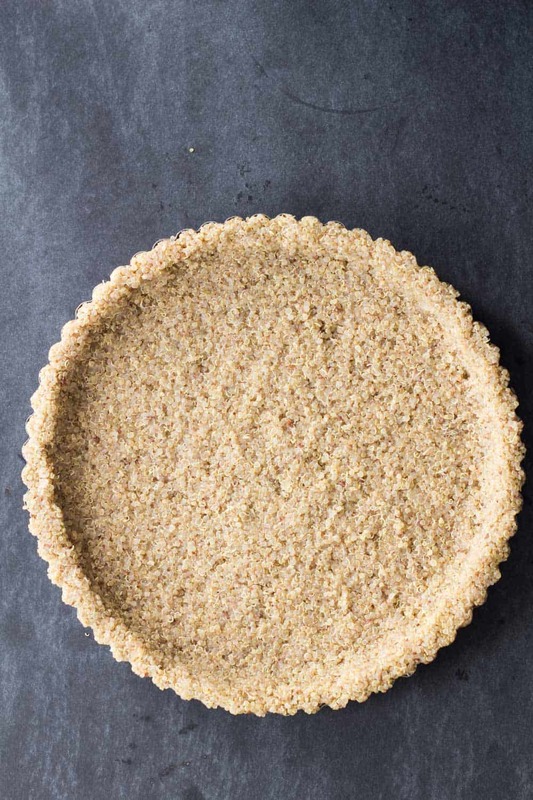 Which makes this a naturally vegan pie crust or quiche crust in the most simple way that can be. Ever heard of a 2-ingredient quinoa crust (3-ingredient if you count water) before? Ya, me neither. That’s why I had to invent it, hehe. 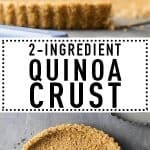 2-Ingredient Quinoa Crust Also Good as Quinoa Pizza Crust? Absolutely! It didn’t occur to me until I made the crust alone without a quiche filling. But look at the picture. Think away the border and you’ve got a wonderful quinoa pizza crust. I’ve never been a big pizza fan but I might just have converted into one with the pure thought of quinoa crust pizza. Grind flax seeds in a small coffee grinder and mix flax meal with 2 Tbsp water in a small bowl. Set aside. Cook quinoa in water as you would rice. Add 1 cup quinoa and 1.5 cups water into pot, bring to the boil, stir well, cover and immediately reduce heat to simmer. Simmer for about 10 minutes or until water is completely absorbed. Remove from heat and fluff with a spoon to prevent from sticking to bottom of pot and quickly cover again to keep in steam. Preheat oven to 400 F (200ºC). Let quinoa cool down enough to be able to work with it with your hands. 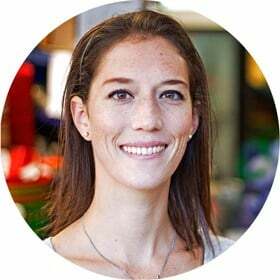 Once quinoa is touchable, add flax meal mush to it and knead together with your hands until the flax seed is thoroughly mixed into the quinoa and everything forms kind of a dough. If the quinoa falls apart into its individual little seeds, add a little more water (1 Tbsp at a time) to make it stickier. The dough may kind of fall apart but in big chunks, not the individual seeds. Put dough in a lightly greased (especially the sides) 9" (24cm) separable tart pan and press into the pan with your fingers until bottom and sides are covered up to the edge. Place in the oven and bake for 25-30 minutes or until golden. This crust serves for both sweet dessert tarts or pies or savory quiche-like tarts or pies. I love quinoa but wonder if this would taste heavy and healthy to those just used to eating a white flour pie crust. I don’t think it’s heavy. Quite by the contrary, I find it easier to digest. If it taste healthy, well, I guess that’s difficult to define. I like white flour pie crust, too and it tastes great. Just different. I tried this tonight with pizza. I pre-baked for 11 minutes and then added toppings and cooked another 15 minutes at 400. My crust was too thick and I should have pre-baked it longer to dry it out more, so that is the first thing I will change. The quinoa under the toppings didn’t get very crunchy. I will probably do 20 minutes before toppings and then another 10-15 after, as it doesn’t really take that long to melt cheese and heat up pepperoni. The flavor was good though, so that helps. I think I may add the herbs into the quinoa instead of the pasta sauce and add a little salt in there as well so the exposed crust portions aren’t so flavorless. The point is though, it is completely doable, pretty darned easy, and my kids had a blast mixing the quinoa and flax and flattening it down. It may take some tweaking, but we will get there. I’m so happy you liked it Stephanie and immediately thought of ways to adapt this to your liking. For pizza you would definitely have to use a bigger form. Here I’m using a lot of dough for the sides. Or you could use this amount for 2 pizzas or a large baking sheet pizza. Putting herbs into the dough sounds like a brilliant idea!!! 20 minutes prebaking is a good idea. I think it really needs at least 20 minutes. Hi – this looks great, can you advise how long this would last for one made as I make healthy treats with dates and nuts and could use this as a base. I can keep the bliss balls for up to 2 weeks, refrigerated. Would this stay good or go soft?? Can this crust be made ahead of time? I haven’t tried but I would think so because if I make a quiche with it and don’t finish it I store it in the fridge and the next day it’s still great. I am wondering if you would care to experiment with unsweetened coconut shreds instead of quinoa. My husband would really love a crust he could eat that is low oxalate. Quinoa would give him kidney stones. Flax and coconut would be the only combination that I think would work for him. Thanks. Hi all! So, I tried making this tonight and it didn’t quite work out. When I poured my quiche mixture into the crust, most of it seemed to soak right through the quinoa. Any ideas on where I went wrong? Thanks! Oh nooo, I’m so sorry this happened to you Leslie, did you prebake the crust for at least 10 minutes? I recommend prebaking to make sure it’s dry and doesn’t absorb all the liquid. Could you use chia seeds instead of flax? You can definitely try but in my experience flax seeds are gooey-er (is that a word?) than chia seeds and thus a better glue. I cannot see how. It is only one cup of quinoa and 2tbls of flaxseed. Yes, the thing is 1 cup uncooked quinoa makes about 2.5-3 cups cooked quinoa and 1 cup of cooked quinoa has about 200 calories. Remember you won’t eat the whole crust alone. Or at least you shouldn’t haha. Oh, I meant to ask – did you try it as a pizza crust? Hi Danny, no I haven’t it’s very high on my to-do-list though. I hope I will be able to update the post soon with that info. WOW!! Kelly, that sounds amazing! Can’t wait to hear how it turned out. I would probably use 1 teaspoon. Too much of it can make it taste bitter. Clove is pretty strong when added too much. Hi Deena, I think you’ll be fine adding honey to the crust, no need to remove any water from the flax egg. You need the water to make the flax become gooey and eggy. How long does the yogurt filling have to go in the oven? Maybe bake the crust about 10 minutes, then add the filling? Greek Yogurt Cheesecake sounds amazing by the way! Hi! Can this be made in a standard pie dish or does it require a separable tart pan? Thanks! Hi Cara, yes, you can make it in a standard pie dish, you just might not be able to take it out and the first pieces will maybe not be easy to cut out nicely. I made this crust for a mango & berry fruit tart. I did add a T of honey to the mixture, just for some sweetness in the crust. I didn’t use any sweeteners on the fruit, so they were both just sweet enough and blended together beautifully. Thank you so much for this recipe! Amazing Brielle!! Thank you so much for coming back and giving feedback. I’m so happy you liked the crust :) Good idea to add some honey for sweetness. Will try next time I make it! really like the look of this. Thanks for the weight measures as I do not use cups. I am thinking of trying the crust but mixing in fresh herbs. Thank you so much…..I am going to be able to eat tarts again. Hi Mary, you are very welcome. I’m German so cups and spoons are not the measurements I grew up with. I try to include both measurements always so aaaalll my readers from around the world can make my recipes :) Herbs in the crust!!! How did I never think of that. That is a brilliant idea!! Ow this looks great! I’m really gonna try this soon!! I Love looking on pinterest for Nice healthy recipies , in Dutch or English. I’m not veagan or glutenfree, Just an healthy eater that likes to try New things. Thnx!! I’m gonna take a look at the rest of your website now! Greetings from the Netherlands. Welkom Eelke! I’m not vegan and not gluten-free either but I love taking up the challenge to create healthy vengan and/or vegan meals for my friends who are vegan and/or gluten-free. Besides, it’s good for us omnivores, too ? Interesting recipe! If using it for quiche (I want to make broccoli and cheese), do you bake it first or add the ingredients to the “raw” crust. The latter, I would think, but I look forward to hearing from you. Hi Nicki, prepare the curst, prebake it at 400F for about 10 minutes while you prepare the filling, then fill and return to the oven for as long as the filling needs. This is so the crust dries out enough on top to not soak up all the filling. I hope your quiche turns out amazing. Broccoli and cheese certainly does sound like a delicious combination. 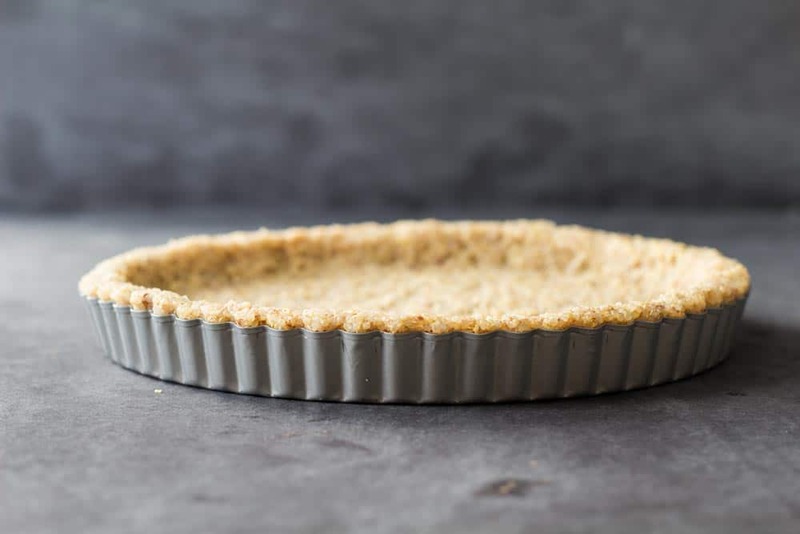 I think the word you are looking for is “whole food” … Vegan and gluten free foods often try to imitate other foods (as you said)… I don’t like that labelling for that very reason… This simple pie crust is a “whole food crust”! Made from two whole food ingredients, quinoa and flax. It is simple and I am sure it will be delicious! Hi Melanie, you are right! Whole Food Crust would have been a great name for it!! Thank you for leaving such a thoughtful comment! several years back I started using grams for all my measurements while trying to regain control over my portion sizes. I am no t gluten sensitive and love pasta. You would be surprised how much pasta I can cram into a cup but 56 grams of pasta is 56 grams of pasta! Thanks for posting this recipe I used to the egg bake recipe but I wanted something other than prepared pie crust for a quiche and I think this one may work. Thanks! You made me laugh Glenna, I see so many people cramming their cups with their less healthy foods they are allowed to eat, hahaha. I include a lot of imperial measurements because most my readers are in the US and Canada and they are used to using imperial I do however create almost all recipes using grams. It’s so much more exact. Yes, don’t be afraid of the word vegan! How much flax is that if it’ s already ground? How much quinoa if it’s already cooked? …as in left-over quinoa. That info would REALLY simplify the recipe. I just found your recipe on Pinterest this morning. I tried it for lunch with tomatoes, zucchinis, thyme and garlic, first sautéed in olive oil, covered with Parmesan and gently grilled: it’s perfect. My husband and I really like it. And it’s really healthy compared to a traditional pie crust. I think it’s going to be a classical pie crust in my vegetarian cooking now. I will be posting this on my Instagram blog (instacleanfoods) for reference. I know what you mean by “you are so so so proud of this recipe”, I have been searching for this for a long time and SOMEONE DID IT!!!! Thank you so much! The majority of people in my household prefer vegan stuff and this will allow me to make dozens of pie recipes i want to try for them . I cant wait to try it after exams, Thanks again! This is such a creative idea! I love it! I have never tried a quinoa crust, but you have totally inspired me! I’m glad I did Andre :D Let me know how it turned out for you.